Earlier today the FBI and Department of Justice replaced the usual content on the websites of Full Tilt Poker, PokerStars, Absolute Poker and Ultimate Bet with this image. It is expected that the online poker companies involved will be fined around $3 Billion dollars for breaches. an indictment against the founders of online poker’s “big three” was unsealed by federal authorities. According to MarketWatch.com, the founders of PokerStars, Full Tilt Poker, and Absolute Poker were indicted on charges of bank fraud, money laundering, and illegal gambling. There were also restraining orders issued against over 75 bank accounts used by the online poker companies and their payment processors, as well as five Internet domain names. The U.S. Department of Justice released a press release on the indictment, and in it, 11 defendants are named: Isai Scheinberg, Raymond Bitar, Scott Tom, Brent Beckley, Nelson Burtnick, Paul Tate, Ryan Lang, Bradley Franzen, Ira Rubin, Chad Elie, and John Campos. Scheinberg and Tate are identified in the indictment as representing PokerStars, Bitar and Burtnick of representing Full Tilt Poker and Tom and Beckley of representing Absolute Poker. Lang, Rubin, Franzen and Elie are identified as people who allegedly ran payment processors. The charges are based on the Illegal Gambling Business Act of 1955 and the Unlawful Internet Gambling Enforcement Act of 2006. These are the same charges previously brought against payment processors used by the sites that have been shut down. The allegations center around poker companies allegedly using fraudulent methods to circumvent federal law and trick U.S. banks into processing payments after the passage of UIGEA. At least $3 billion in civil money-laundering penalties from both the poker companies and defendants is being sought. According to the indictment, Campos and Elie were arrested Friday morning in Utah and Las Vegas, Nevada, respectively. Franzen is expected to appear in court for his arraignment on April 19, 2011. Those who are not in the U.S. — Scheinberg, Bitar, Burtnick, Tate, Tom, Beckley, Rubin, and Lang — have not been arrested, but the U.S. Attorney’s Office in the Southern District of New York is working with foreign law enforcement agencies and Interpol to arrest the defendants. 11:55 a.m. PDT: PokerNews has attempted to contact all three online poker sites, and thus far, only UB/AP has replied and has no comment at this time. 12:26 p.m. PDT: PokerStars has blocked U.S. players from real money games. 1:00 p.m. PDT: If there is any bright side to this black Friday, it could be that this DOJ affront makes it clear to Congressional leaders like Senate Majority Leader Harry Reid that federal legislation to officially legalize online poker must move quickly. It could also spark online poker players, with their livelihood attacked, to band together more than ever before and make their voices heard. 2:00 p.m. PDT: The Courier-Mail newspaper in Australia is reporting that it is believed that Daniel Tzvetkoff is assisting federal lawyers in the Southern District of New York, the branch of the DOJ behind today’s affront. Tzvetkoff was arrested April 16 of last year in Las Vegas and charged with the same counts the site owners are being charged with today for allegedly processing $523 million in Internet gambling earnings through his payment processing company Intabill. Though he was originally denied bail as a flight risk, the Courier-Mail reports he was released on bail in August after cooperating with federal authorities, and is living in a secret location in New York City. The arrests today of the people who allegedly ran payment processors could be a move to get more people knowledgeable of the business transactions of the Internet poker sites to co-operate against the sites. 2:40 p.m. PDT: The 11 defendants listed above are each being charged with four counts — violation of the Unlawful Internet Gambling Enforcement Act, operation of an illegal gambling business, conspiracy to commit bank and wire fraud and money laundering conspiracy. These charges can carry hefty penalties. 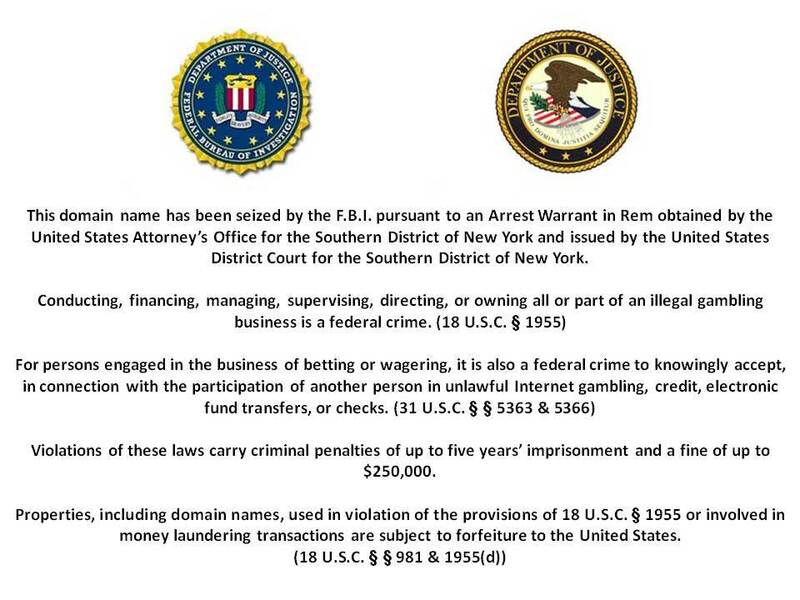 The maximum penalty for violation of the UIGEA and operating a gambling business is 5 years in prison and a fine of $250,000 or twice the gross gain or loss for each charge, for conspiracy to commit wire fraud is 30 years in prison and a fine of $1 million or twice the gross gain or loss, and for money laundering conspiracy is 20 years in prison and a fine of $500,000 or twice the amount laundered.